Looking for a gift that lasts forever? Consider the gift of land with a Door County Land Trust Gift today! When you give a gift membership, your friend or family member joins a group of people who cherish and care for Door County’s exceptional lands and waters. In addition to all the communications and invitations to events or hikes shared by all Land Trust members, new members are welcomed with a gift package of our most recent newsletter, a Land Trust window decal, a hiking map for nature preserves, and a copy of the Door County Land Trust’s Guide to the Places We Protect, along with a letter informing the recipient of your gift. Make a gift membership donation online. On the online form, choose “General Donation” below your address information; within the “Optional” section type the name and contact information of the person to receive the gift membership; in the “Special Instructions” box, please write that this is a gift membership. 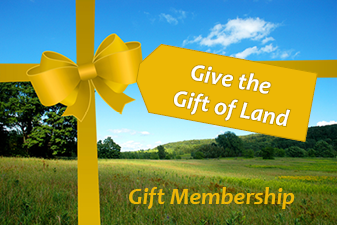 Download a gift membership form to complete and return to the Land Trust office by mail. 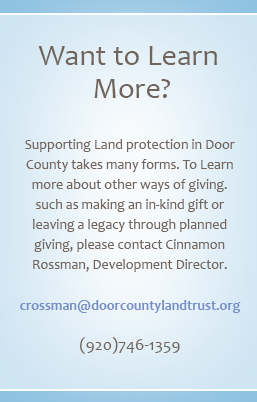 Please note that if your gift recipient is already a member of the Door County Land Trust, your gift will be treated as a gift made in their honor. See Tributes & Memorials for more information. Please allow 10-14 business days for shipping during busy holiday seasons.